Reson8 Messaging Server is a complete text Messaging solution enabling organisations to provide SMS messaging facilities to their personnel and corporate information systems using existing messaging infrastructure and line of business applications. Reson8 Messaging Server runs on the latest Windows, and Linux platforms. The system provides multiple channels, GSM Modem, HTTP or SMPP, for broadcasting messages. A Network or GSM Modem based 2-Way SMS solution for sending and receiving messages from employees and customers. Message processing infrastructure to allow Client to operate a Short Message Service directly between Client's IP network and GSM mobile phones. A middleware system to receive and process SMS requests, "pull messaging" from mobile phones. The messaging routes can easily and quickly switch between the GSM, IP Gateway, or SMSC channel to send messages using different transports. The transports can be selected programmatically. 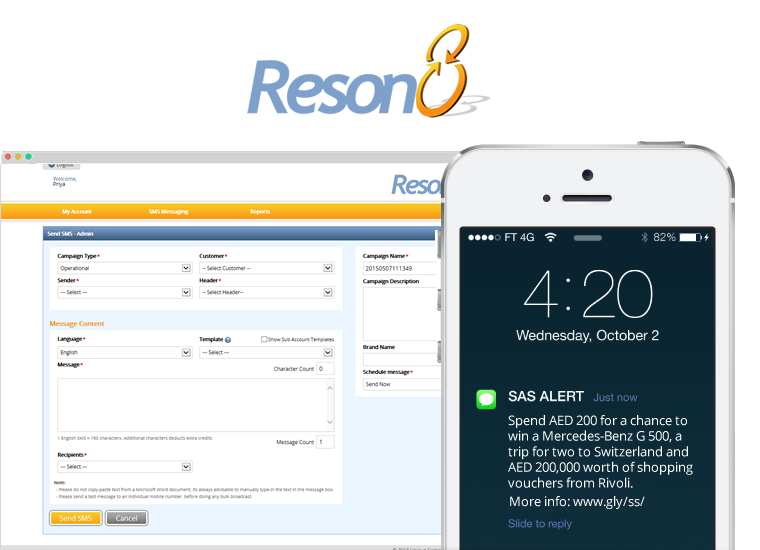 Reson8 Messaging Server offers built-in support for access management and customer account creation, connectivity and routing to multiple transports, a powerful business rules engine to process and validate all outgoing and incoming messages, and complete billing, reporting and account information management and archiving. It also provides a complete messaging API for database connectivity and communication with client applications. One-stop solution for multiple requirements. Enhanced efficiency. Send information instantly and accurately.